Water/Hydrology - Fizz Boom Read! Water is a necessary part of everyday life. Giving baby a bath is one of the first interactions a caregiver will have with their child. Water is also one of the few chemicals that people may easily observe in the three states of matter: solid, liquid, and gas. *Water Feature: Add an aquarium, fish bowl, water fountain, or some plants that grown in water for the children to observe. Will it Float? : Lay out a tarp and place a plastic tub with 2"-3" of water in it on the tarp. 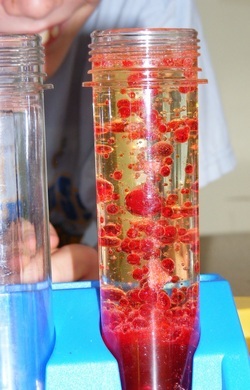 You want enough water that there is a definite difference between sinking and floating, but not enough that the water will overflow during the experiment. Have a selection of items for the children to test -- crayons without wrappers, plastic toys, rocks, corks, utensils, ice cubes, paper, etc. Let the children experiment with what sinks and what floats. Older children may want to keep a record of what they think the object will do, versus what it actually did. Replace the water frequently to keep it clean. *Bubbles: Purchase a bubble machine, or a simple bottle of bubble solution and allow the children to chase and pop the bubbles. This may be done inside or outside. *The Goldfish Song, by the Laurie Berkner Band. (You will need to click over to youtube to watch this video as the permissions do not let it play on another site. Sorry!) GREATEST. SONG. EVER. This recording is a little bit different than the one I have, but the kids LOVE it. I have a rug we use as the rock, or if I'm in a home, we use a couch. And then when we swim, we run all around the room and its pretty much the greatest thing ever. Caregivers and children all stand or sit and hold the edge of the parachute and sing the "My Bathtub" song, raising and lowering the parachute each time you sing "bathtub," "splash," or "splashing." Alternatively, caregivers stand and hold the edge of the parachute and children sit underneath. You can also place a stuffed animal on top of the parachute for the children and caregivers to toss around! It's okay if the raising and lowering becomes an enthusiastic tidal wave, just encourage caregivers to keep an eye on their little ones! So splash in my bathtub with me! Splash in my bathtub with me, with me! Oh, splash in my bathtub with me! Cover the work surface with the tablecloth. Make a horizontal line 3" from the bottom of the bottom of the bottle and another 5" from the bottom. Break the antacid tablets in half and place one half at each place, along with one bottle. Place the funnels, oil, water, and good coloring within easy reach of each place. Show children how to fit the funnel into the top of the bottle. With the help of a caregiver, ask children to pour the oil into the bottle up to the lower line (3"). Once they're done, ask them to slowly pour the water into the bottle so the liquid rises to the higher line (5"). The water is heavier than the oil, so it will pass through the oil and sink to the bottom. Explain to them what is happening and why. After the water settles, ask them to put three drops of the food coloring into the bottle. The food coloring will also pass through the oil, mixing in with the water. Once the color has blended into the water, ask them to drop the half tablet of antacid into the bottle. The water will roil and bubble, sending colored blobs up into the oil. Because the colored water is heavier, it will want to sink back to the bottom. The effervescent tablet will push the water back up, causing a bubbling, magical storm in the bottle, reminiscent of a lava lamp. The process will continue until the tablet has completely dissolved. If children are taking their bottles home, give them lids to screw on tightly AFTER the tablets have dissolved. WARNING! : Putting a lid on while the tablets are effervescing will cause the bottles to explode. Once they are frozen solid, empty the ice cubes into a big bowl or bucket. Take the bowl outside and try setting the ice cubes on warm pavement. Encourage children to guess what is in the ice before it melts. Can they see a color or shape in the ice to help them figure it out? You'd be surprised how simple things like buttons, bottle caps, small toys, and large beads become exciting discoveries! Demonstrate for your child how to hold the brush, dip it in the water, and "paint" on the concrete. Encourage them to pick up their own brush and try it for themselves. Try painting their name, saying each letter as you paint it. Paint simple pictures, like clouds or flowers and ask your child to guess what it is. Ask your child to paint a picture and have them tell you about what they are painting. How quickly the pictures disappear (evaporate) depends on how sunny and dry the weather is.